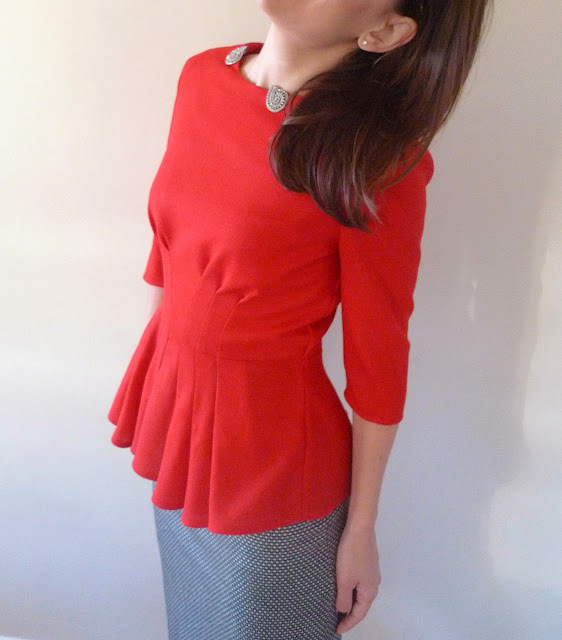 Thank you for all of your nice comments on my first peplum...it sounds like I'm not the only one with peplum trepidation! I'm just back from a family trip to Ireland to visit my husband and brother-in-law's sides. (A sweet coincidence, my sister and I both married Irish guys.) Sure enough, it rained but it was cozy and we had moments of sunshine, and to be honest a small part of me looks forward to this weather...forced hibernation/sewing time! So anyway, here's number 2, a more prim version inspired by this Goat dress I spotted in a posh department store, when taking the long way to the tube after work one night. 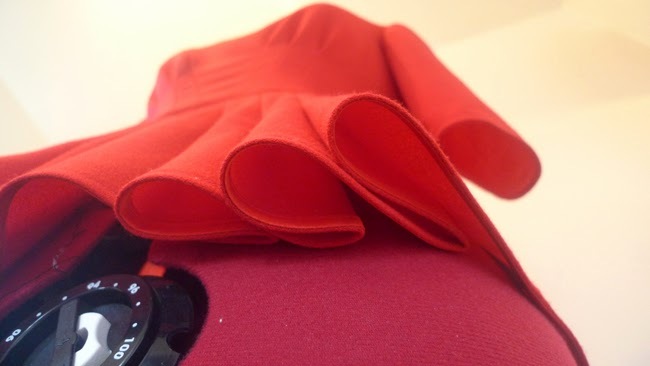 I fell in love with the colour and the front pleats (but not the price tag), and remembered that I had a metre of red wool gabardine left over from my gathered dart skirt and tutorial. So with my patternmaster and trusty blocks I was able to create something like it (take that, posh department store)! 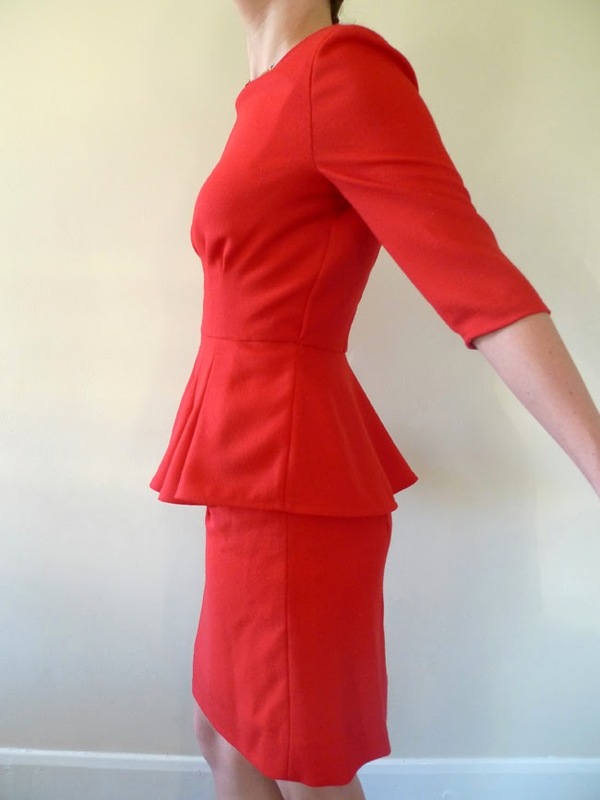 Like my last peplum, a metre of fabric was only just about enough. I would have liked the sleeves to be a little bit longer, only about an inch or so. Maybe I'll replace them if I get hold of this fabric again....maybe not. 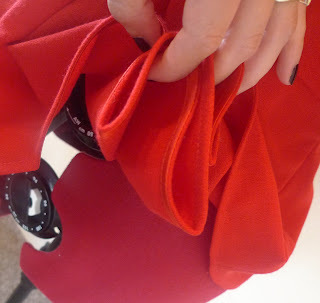 Here it is with the matching red gabardine skirt. 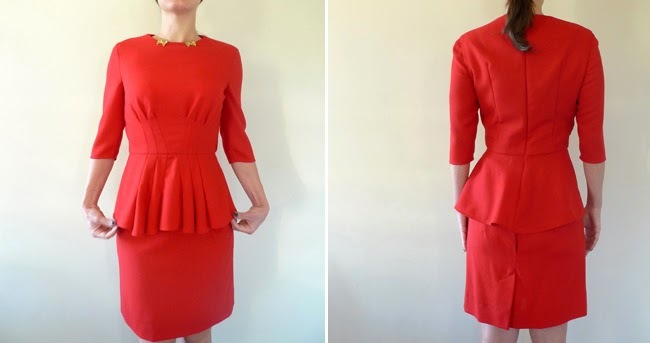 - ...but this gave the peplum too much body, which I loved at first, but it caused the folds of fabric to flip inside out. To remedy this, I pressed a seam on the inside of the folds and let the outsides curve naturally. Safe to say I've got peplums out of my system for now. Hope everyone is keeping warm, happy sewing! Love the top with the first skirt! This is so stunning. Very clever. I love your collar clips too! By the way I finally sewed my melly liberty fabric! I won't be posting the dress for two weeks yet but very happy with it. This is fabulous! I love the front pleat/dart details and the soft folds. The top looks great with both skirts. 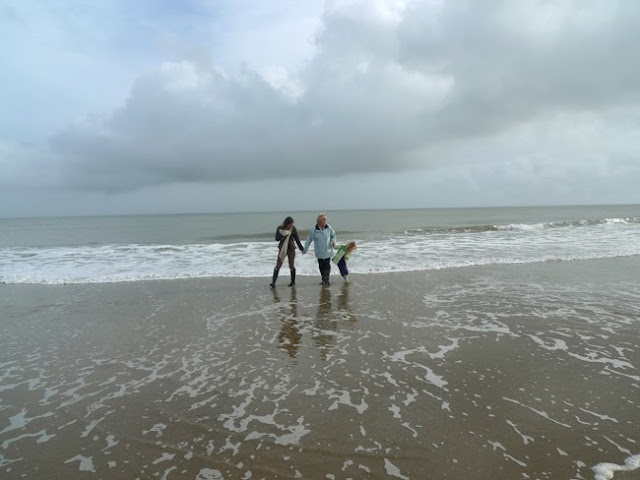 Thank you for sharing the Irish Sea photo as well -- so beautiful. This is beautiful. The tucks remind me of a similar Knipmode dress from 2009-just really elegant. Perfect length, colour and flare on you. Love it. Wow!!! I love the outfit with the red peplum and the blue skirt, they match very well. The inside looks neat with the bias tape. This is beautiful! The way the pleats/darts are placed are so graceful! I see what you mean about the sleeve length needing a little tweaking, though. If I may make a suggestion, you could try shortening the sleeves so they end about a half inch (1.25 cm?) above the elbow. That could be a really nice look! Also, I too love the picture of the Irish Sea. It makes me nostalgic for the time I spent living in Dublin! Hi Cari, sorry very late reply I've been away! Great suggestion I love that just above the elbow look and cheaper than sewing in a new sleeve! You got to live in Dublin, you lucky one :)! Did you end up shortening the sleeve? I would love to see the result! I only got to live in Dublin for 3 months, as I did part of my teaching practice (what we call "Student Teaching" here in the States) at Blackrock College. It was an amazing experience, and I fell in love with the city! I would love to be able to go back some day! Hi Cari! I haven't had a chance yet - just in the middle of a house move! Hopefully will get a chance before Christmas and will take a pic if I do! This is amazing, so classy in the red as well! I love it..